Uranium hexafluoride that has been heated to a gaseous state is fed into a rotor inside the centrifuge machine. The rotor spins at a high speed inside a steel casing. The casing maintains the rotor in a vacuum and provides safety containment in case of a failure inside the machine. The centrifugal force created by the spinning rotor concentrates the heavier U-238 isotopes at the outer wall of the rotor and the lighter U-235 isotopes toward the rotor center. Gas circulation inside the rotor carries the U-235, the product or enriched stream, towards the top of the rotor and the U-238, the tails or depleted stream, towards the bottom of the rotor. Methods of collecting both streams are positioned accordingly within the machine and the product and depleted streams are then fed on to the next machines in the cascade. 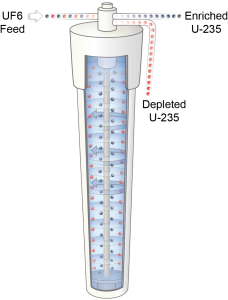 Since the desired enrichment level cannot be achieved in one centrifuge, several machines must be connected in series and parallel in what is called a “cascade”. A centrifuge enrichment plant is made up of multiple cascades. Proven technology: Centrifuge technology is a proven enrichment process. Currently various forms of this technology are used in several countries. Low operating costs: Its energy requirements are 95% less than the requirements of a comparably sized gaseous diffusion plant per unit of enrichment. Modular architecture: The modularity of the centrifuge technology allows for flexible deployment, enabling capacity to be added in increments as demand increases.